The child and pet-friendly way of getting rid of slugs and snails from the garden. Suitable for use in gardens and on allotments around vegetables, strawberries, lettuce and ornamental plants - there's no waiting period between application and harvest of edibles. Kind to pets, hedgehogs, earthworms, bees and other non-target animals. No messy slime trails and doesn’t leave visible dead snails. Extremely resistant to rain due to innovative bait technology if they get wet, they become even more attractive. Approved for organic gardening by the Organic Farmers and Growers Association and suppilied in a 650g pack. Slugs and snails can cause an awful lot of damage in the garden both to edible crops and to prized ornamentals. 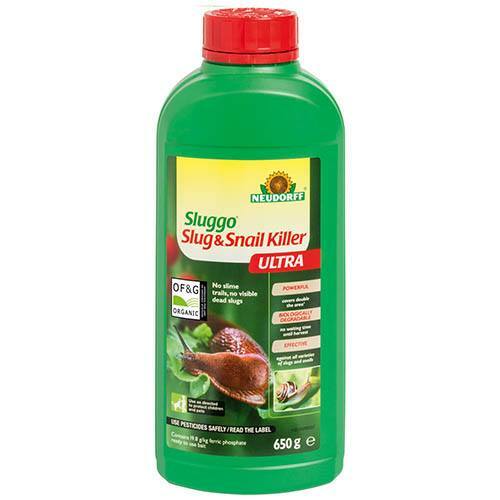 Our 'Sluggo' Slug & Snail Killer is however the new and easy way to keep these garden pests at bay safely and without harming the environment. Effectively controlling slugs and snails on all types of vegetables, fruit and ornamental plants, the pellets are rain resistant and swell when damp to make them even more attractive to slugs and snails. The active ingredient is Iron-III phosphate - an iron compound that also occurs in nature which causes cellular changes in the intestinal region of the slug/snail. After consumption the slug or snail buries into the ground due to feeling unwell and then dies beneath the surface of the soil. This ensures that there are no dead slugs left on the soil nor any of the unpleasant slime trails that are associated with traditional slug pellets. 'Sluggo' pellets that are not eaten simply breakdown into iron and phosphate which are both plant nutrients that occur naturally in the soil. Best of all, when using 'Sluggo' pellets as directed children, pets, birds and wildlife may enter the treated area without the risk of poisoning - so you can be sure that they are safe to use around the garden without harming your kids, pets or other wildlife. Please remember to keep the pack out of the way of pets and children when not in use.